Congratulations on your new child in your family. This is a wonderful gift. You can begin the Baptism preparations by contacting Fr. Shaun at frshaun@stfrancisa2.org or call 734-821-2100. 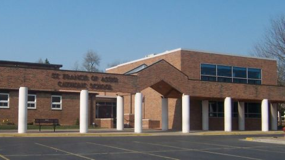 Our St. Francis community will offer fellowship and formation for your child and family. We celebrate children’s baptisms during the Sunday 12:30 pm Mass most Sundays of the year. Many parishioners are involved in the preparation of this celebration, such as Baptism class facilitators, Baptism set-up team, sewing team, and communications team. If you are interested in helping out, please E-mail Fr. Shaun at frshaun@stfrancisa2.org or call 734-821-2100. 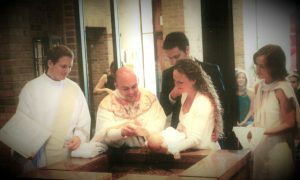 If one Godparent is baptized but not Roman Catholic, that person can be listed as a Christian witness and must be willing to fulfill the role of a Godparent for your child. Catholics who have not received the sacrament of Confirmation cannot serve as Godparents. St. Francis Parish asks that Godparents who are not registered at St. Francis as parishioners have this form signed by their local pastor and return it to St. Francis one week before the scheduled baptism. Register as a parishioner if you have not done so. Attend an Infant Baptism Class on a first Thursday of the month at 7pm. If you took a class within the past 5 years at St. Francis or another parish (and can provide proof of attendance), skip to step 3. Have your selected Godparents get this form signed by their local pastor (if they are not parishioners at St. Francis). It must be returned one week prior to the scheduled baptism. – Interested in the Catholic faith? – An adult or teen who was never baptized? – A parent of a child (over the age of 7) who did not receive Baptism as an infant? – A member of another Christian faith who is seeking to join the Catholic Church? – A baptized Catholic who never received any religious instruction? – A baptized Catholic who never received First Eucharist or Confirmation?